Things you need to consider when installing a birthing pool – a Midwife’s guide. 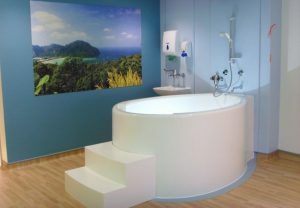 As the demand for active birth – and water births in particular – increases, more and more trusts and birthing units are installing birthing pools. Here, David Weston, owner of Aquabirths in West Yorkshire shares his expertise and experience and gives guidance on “where to start”. As with many things in midwifery, you have to start with the plumbing. Is there already a bath in the room where you plan to put your pool? Or at least a sink? 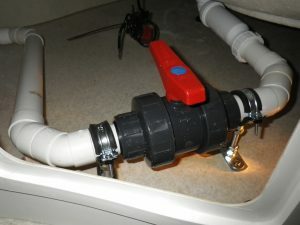 If the plumbing is in place to begin with, it makes life a lot easier and the job a lot cheaper. One critical thing is the height of the existing waste water pipe. 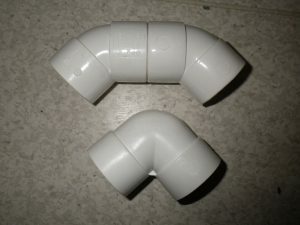 Ideally, the waste water will leave the room either at, or very close to, floor level so that pipe-work from plughole to waste drain is at a steep enough gradient to enable the water to empty quickly. A valve and a trap need to be fitted in under the bath and it’s a case of getting them in before you run out of height. 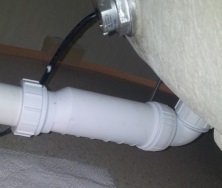 If the waste pipe is a few inches up the wall, then the bath will probably need to be raised, which can add to the overall cost of the build. Space. When putting a pool into a birthing room, you might also want to consider what else you want in the room. 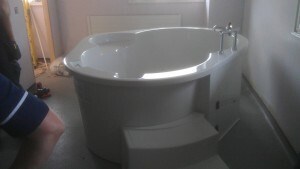 Other room uses may impinge on the bath – for example, plug sockets for CD-players need to be at least 3m from the bath. It’s always a good idea to make contact with an experienced Birth Pool specialist very early in the process. Any company worth their salt will be willing to chat through your options with you, or be prepared to visit you, even before you have engaged an architect or project manager. I have seen rooms with birthing pools left unused or – worse still – used as storage rooms! Allowing time to properly consider how best to equip the room with other equipment can avoid this. If you want a bed in the room with the birth pool, will you want to be able to move the bed in and out also? Will there be enough room to do so. You don’t want to find yourself in a position of not being able to offer the birth pool to women who want it because someone rammed it with a bed and the estates office have told you it can’t be used. Colours and features. 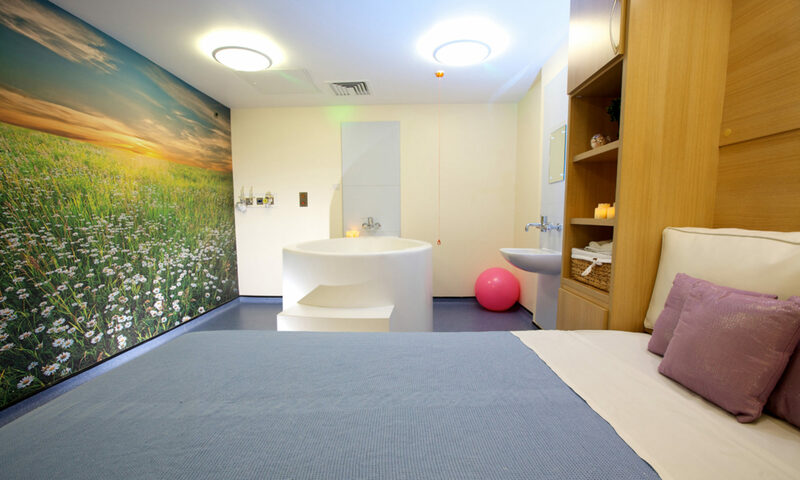 Gone are the days of “it comes in white…or white” A birthing bath can be any colour and any shape you want and many of the baths we have installed have been adapted to suit the needs of individual midwifery teams. If you have a “dream” birthing pool in mind, don’t be afraid to ask. Modern moulding techniques mean that bespoke baths are much more affordable than they were ten years ago. When it comes to taps, choice can be a little more limited because of the various regulations that apply to hospitals. Any good birth pool company will know their way round these regulations and should still be able to offer you a number of alternatives. It is probable that this is something that can be sorted by the hospital’s Estates Department. You can also request additional features and modifications such as LED lights inside the bath, a choice on the position of the waste outlet and even the addition of an anti-bacterial gel coating. Make it a Team Effort Involve the Estates Department as early as is possible / helpful to you. They may be able to help with much of the above and undertake some of the works to make your budget go as far as possible. We do offer an installation service for our pools so you can be sure it is fitted correctly. However, budgets are often stretched and it should be possible for the hospital’s own Estates Department to fit the bath. Make sure your pool comes with instructions and telephone support from the birth pool provider. If you’re not sure, ask. A birth pool may be one of your biggest investments of the year, so don’t be afraid to ask questions throughout the process. Once the bath is in, it’s sometimes too late to make changes so keep the channels of communication open throughout the design, build and installation process. 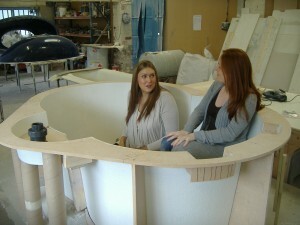 A good birth pool company will have time to talk through your options and be willing to answer any questions you have. It’s a good idea to have clarification on points you are unsure of in writing to avoid any confusion or surprises later down the line. If you discuss something with your birth pool provider on the phone, drop them a quick email afterwards to confirm what you agreed. Don’t assume that because you know exactly what you want, they do too – they’ll only know if you tell them.